Asian College of Journalism (ACJ) Entrance Exam Application Form 2020 will be issued by the Asian College of Journalism. The application is available in both modes i.e. online as well as offline mode. Candidates who wish to appear in the ACJ entrance examination need to register themselves for the examination. The direct link to apply online will be provided below. Students can visit the official site for downloading the application forms. 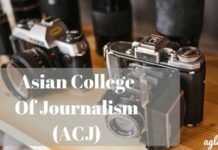 The ACJ entrance exam is conducted annually by the Asian College of Journalism for granting admission to eligible candidates in the post graduation courses offered by the Asian College of Journalism (ACJ). Candidates can fill and submit their application form on the official website or they can also download and fill in the necessary details and submit their application forms. It is mandatory that the candidates submit their application forms before the last scheduled date to successfully register themselves for the exam. Last date of application form to be announced! 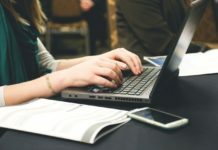 Application Form: The application form of Asian College of Journalism (ACJ) Entrance Exam 2020 will be available at the official website www.asianmedia.in. 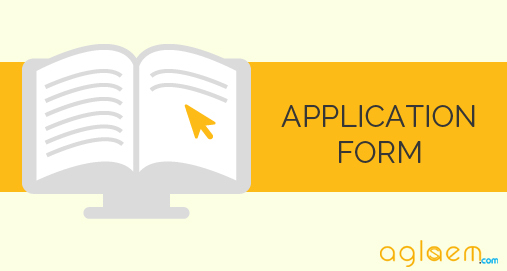 Application whether online or hard copy will need to be sent along with an application fee of Rs 2000/-. Candidates applying for both programmes need to pay only a consolidated processing fee of Rs. 3000/- The fee can be remitted as an online transfer or sent as a Demand Draft in favour of “Media Development Foundation”, payable at Chennai with your reference number, full name, email id and mobile number written on the back of the DD. In the case of online transfer, the applicant will be directed to the Online Payment gateway once the form is completely filled. The applicant is requested to keep the Credit Card/ Debit card/ Net Banking details ready for making the payment. The applicant using the payment gateway service is required to pay the convenience fee as prescribed by the service. SC/ST applicants are exempt from the application fee on production of their community certificates. Applicants are required to indicate, in their completed application, the media stream they wish to specialise in, i.e Print, New Media, Television and Radio. Application Forms will be processed only if they are complete in all respects and on receipt of the application fee. Ensure that all field in the form is completed correctly. Email ID and Mobile Number furnished must remain valid since all communication from ACJ will be sent to the mobile number and email id furnished by the candidate. Applicant’s recent passport size colour digital photo in JPEG/PNG format. The face should be clear and facing up front. PLEASE NOTE NO SELFIES. Scanned copy of family income proof if you intend to apply for the scholarship (e.g. pay slip, last filed income tax return of earning family members). Scanned copy of community certificate if you intend to apply for SC/ST scholarship and avail exemption from the application fee. Education details of school and college which include the year of study, subjects and percentage of marks/grades obtained. 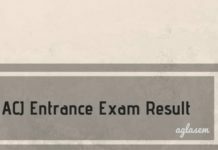 Insofar, official details of the Asian College of Journalism Entrance Exam 2020 have not been announced. Information on this page is as per last year brochure and for reference purpose only. As soon as ACJ releases Asian College of Journalism Entrance Exam 2020 information brochure, details will be updated here.